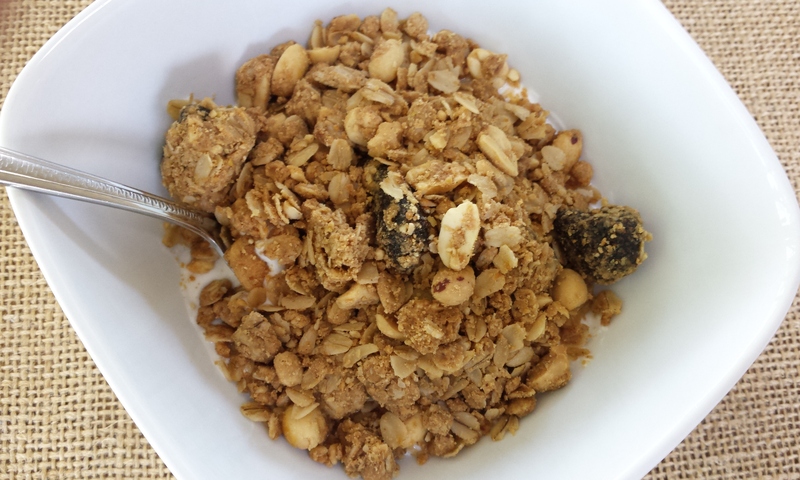 Today’s post is one of my favorite kinds of recipe posts – a GRANOLA recipe post. 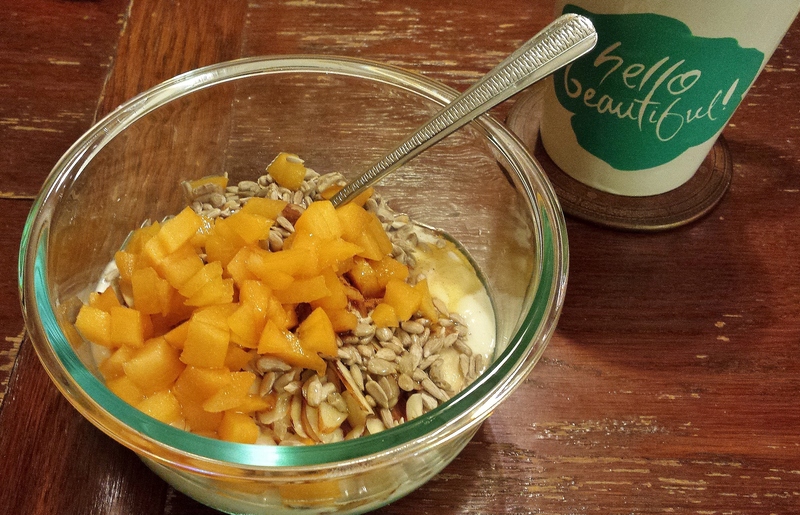 Say hello to Pumpkin Harvest Granola! Blustery winds, dipping temps, waning daylight – it’s official: fall is solidly here to stay where I call home in Metro-Detroit. The extended run of 80-degree days we enjoyed through September is not likely to regale us with an encore at this point (though I’ll forever be an optimist hoping for that one last scorcher of a day to pop up and surprise us). Fall’s lucky it’s so cozy and has those pretty-colored leaves swirling about as distractions from the fact that for those of us in the northern climes, warm weather is essentially dead for the next six-plus months. 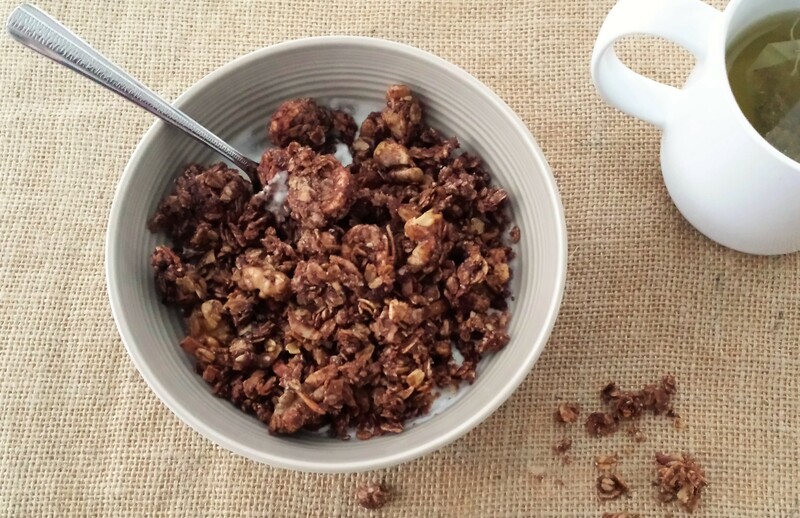 And as luck may also have it, fall is the perfect atmosphere in which to bake granola. 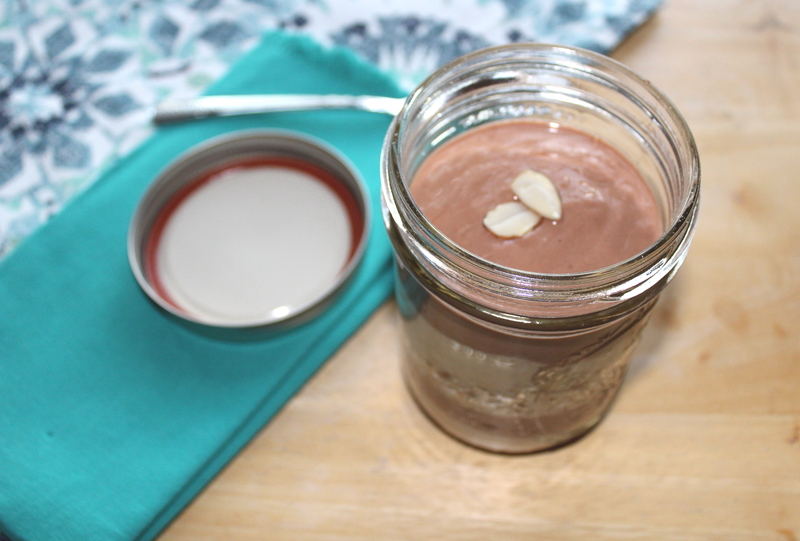 We’ve got another smoothie bowl recipe on the docket today! 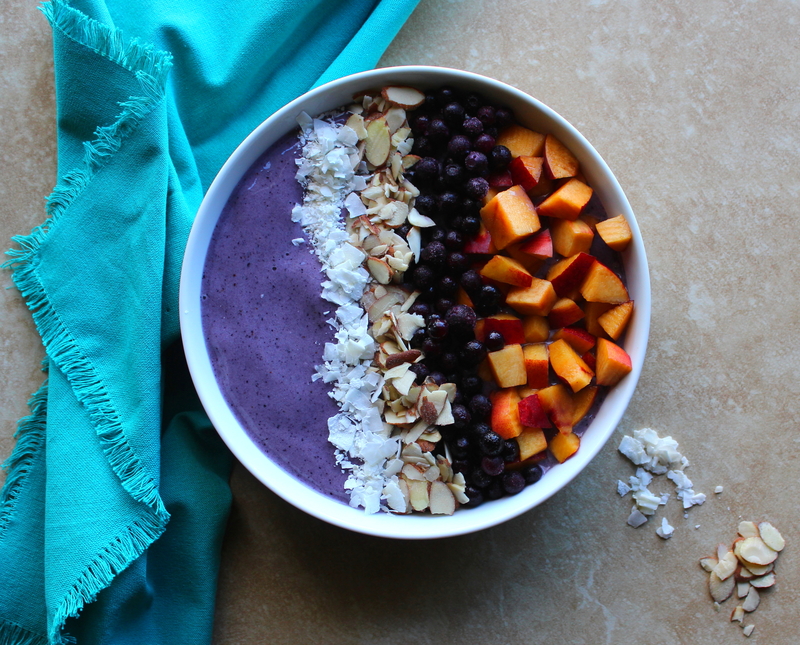 Say hello to Banana, Wild Blueberry, and Nectarine Smoothie Bowl! 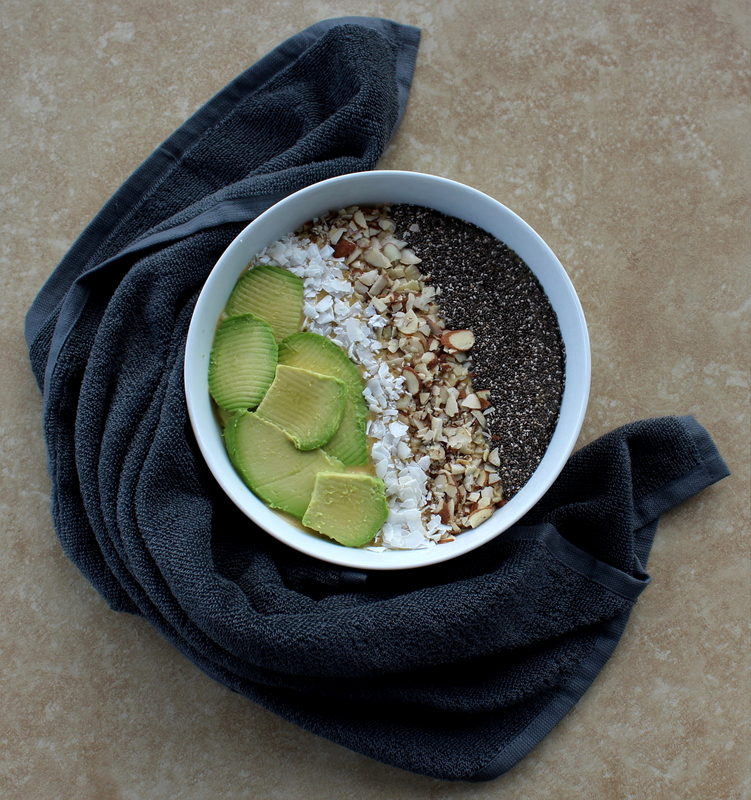 This smoothie bowl is truly a POWER breakfast. And I don’t know about you, but power breakfasts are what I need right now. This spring is proving to be a CRAY-CRAY-busy time for me. I’m a first-time maid of honor for a beloved friend, an experience that has been a fun and special one for me, especially since my pal is the most laid-back, total-antithesis-to-Bridezilla bride ever. But as anyone who has been in a wedding party knows, the wedding stuffs do not happen by themselves. The planning is INTENSE! I am in need of healthy, hearty fuel now more than ever. That’s why I love this Banana, Wild Blueberry, and Nectarine Smoothie Bowl. It’s totes healthy – I mean, look at all of the goodie ingredients included in it: fruit, fruit, and more fruit, with almonds, honey, almond milk, and ground flaxseeds added for good measure (cuz they’re great for digestion plus loaded with beneficial components such as omega-3 fatty acids and fiber). All those vitamins swirling around in one bowl ~SQUEAL!~ This Banana, Wild Blueberry, and Nectarine Smoothie Bowl is a nutrient-junkie’s dream, especially since it contains the HOLY GRAIL of beneficial foods, the WILD BLUEBERRY. Happy Spring, guys! 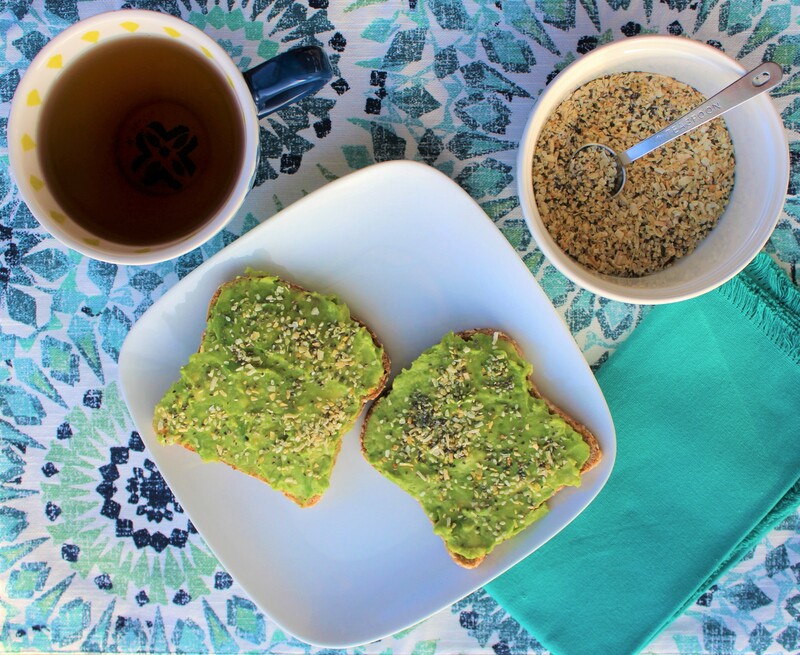 To celebrate this wonderful season of growth and rebirth and greenery, I’m bringing you this recipe for the dashingly spring-hued Avocado Everything Toast, which also happens to be one of the BEST things I have ever tasted in my life. What makes this avocado toast “Everything” toast? It’s topped with Everything bagel seasoning! Heralding Saturday as amazing is not a revolutionary declaration, I know. Most of us are pretty damn into today. I’m especially excited because here in the D, we’re supposed to have a temperature high of 60 degrees today – 60! In February! Heck yes I will be spending as much time as possible outside today! And to top it off, I’m presenting an incredibly healthful + scrumptious breakfast recipe that will get us all revving high and ready to take on this beautiful day. Say hiya to the Turmeric-Kissed Date and Banana Smoothie Bowl with Sliced Avocado!!! 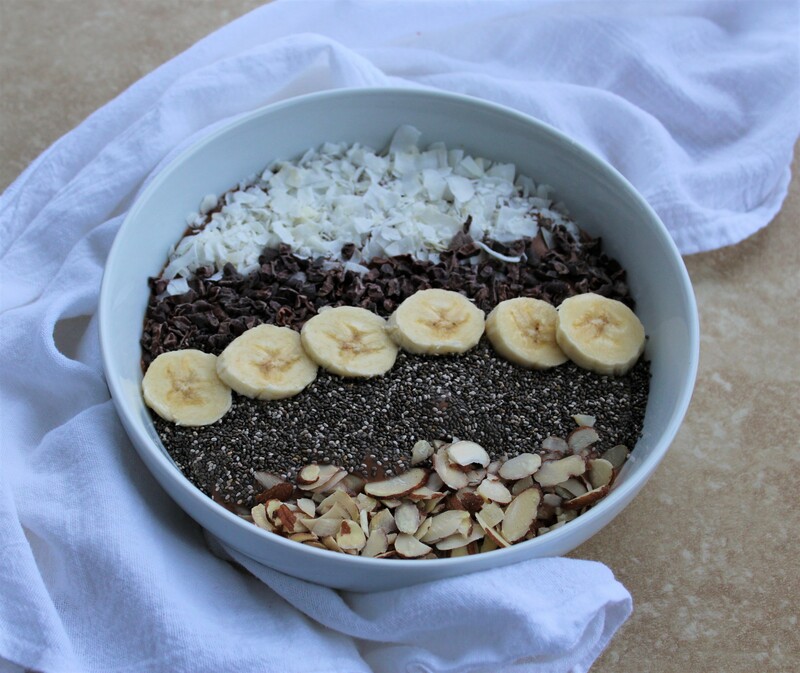 Why is this smoothie bowl so rad? Today is all about the kind of chocolatey, coconut-y banana-laden goodness that beckons you out of bed in the morning with a smile on your face and joy in your heart. Chocolate Coconut Banana Smoothie Bowl is IN THE HOUSE!!!! I’m a wee bit enthused about this one. This Chocolate Coconut Banana Smoothie Bowl recipe contains unsweetened raw cacao powder AND cacao nibs (think a more natural version of baking chips). Unsweetened raw cacao is LIIIIIFE, in my book. Happy Monday, all! OK, I know Mondays are not the happiest days for those of us who have day jobs that don’t line up with the jobs in our head. In my head, I am an independent boss-lady creative phenom, holed up in my home office donned in jammies and leopard-print slippers, lovingly toiling over this blog and my other one, 100 Places in the D – and perhaps writing a novel or two while I’m at it (because why not?). So I totally get it. We all have our true passions, and being a cubicle rat working for The Man isn’t one of them! But we might as well make the best of where we are now, because gratitude is one of the prime ingredients that will shift us into being our truest, most authentic selves. Well, gratitude and peanut butter. And chocolate. And some really yum organic yogurt. Happy Leap Day, all! We’ve got a little bonus day here, a last chance to cram some amazing goodness into February. Lovely February! Confession: February has historically been my most hated month of the year, for reasons that are pretty obvious if you, like me, live in a northern part of the Northern Hemisphere. It is cold. It is gray. It is icy and snow-slushy and yucky. It’s the tail-end of winter, stillllll hanging on, with no feeling of the end in sight most winters (this winter has been pretty darn easy for those of us in the Detroit area, but still. It’s winter). I hated February so much for so long that it became quite a drag to me that I hated it. I was supposed to go out to brunch Sunday, but a little bully of a snowstorm derailed that. It wasn’t a blizzard, but it was enough slick roads and nastiness to keep me from getting on to the freeway and sliding around like a bumper car. After a high of about 50 degrees and walking around outside without a coat on Saturday, we are now sporting average highs around 20 degrees, blasting gales with wind chills in the single digits, and this lovely, freeze-y, arctic tundra landscape. Winter is finally upon us in Detroit! We’d been pretty spoiled so far this season with only one big snow prior to this last week. Reality check! Wah wah. But the one positive thing about inclement weather cancelling my plans on Sunday was that I got to stay home and make coconut chocolate banana granola. A fresh snowfall equals beautiful but not so delicious. 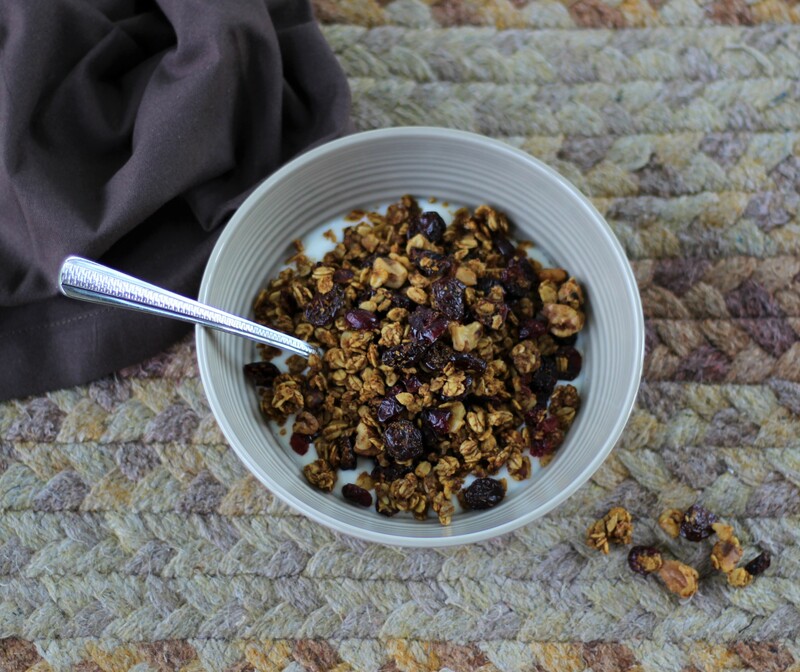 This granola equals beautiful AND delicious! Peaaaanut – peanut butter – and jelly! I’m sitting here singing the above in a lilting, off-tune voice in my head (yes, my internal singing voice is as off-key as the one associated with my vocal box!). I seem to remember hearing this little ditty about peanut butter and jelly at some time somewhere when I was a kid – probably in some beloved cartoon or on a show like Sesame Street. I think most of us grown-ups can probably still identify with that childhood love of PB&J. I suspect it’s why the idea of making a granola based around this combo stuck in my head for months and wouldn’t go away until I did. 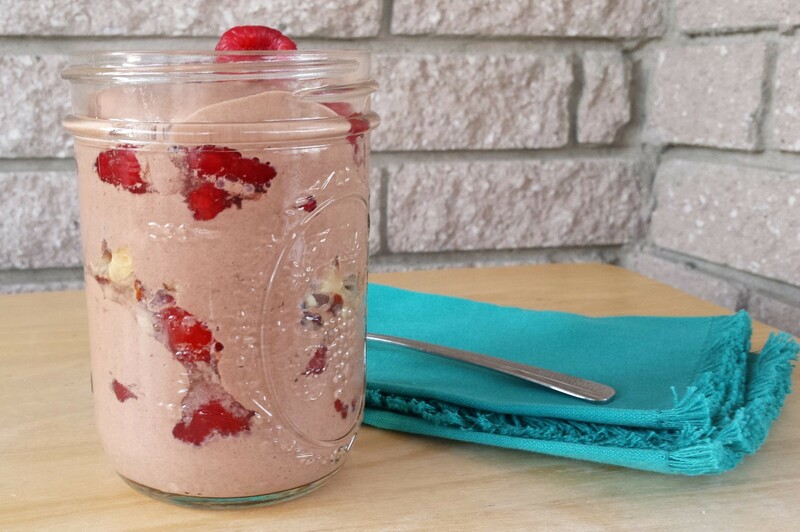 While I was cooking this weekend, I was listening to an entrepreneur-focused podcast where both speakers started bonding over their love of make-ahead yogurt breakfast parfaits that they put together in Mason jars. I thought, how fun! What a great idea!